“Formed in 2006, LGBT Books to Prisoners is a lifeline to queer and trans people who are incarcerated across the United States. Their all-volunteer, donation-funded collective sends books and educational materials that respond to requests from LGBTQ-identified people as directly as possible. In an oppressive system that hits trans and queer people especially hard – especially since these populations are incarcerated at much higher rates than the general population and often victims of physical and emotional hardships while incarcerated – this gives power back to queer and trans folks, letting them know that there is a community prepared to support them and that is listening to their wants and needs. Many of the books that people ask for affirm queer and trans identities, with characters or topics that embody the full scope of the LGBTQ experience. These books are also some of the hardest to keep in stock given the number of requests that LGBT Books to Prisoners receives. We’ve sent books to over 7,000 people in the past ten years, sending over 10,000 books each year. That’s why we were so excited when Otter approached us about getting her novel to trans folks in prison. 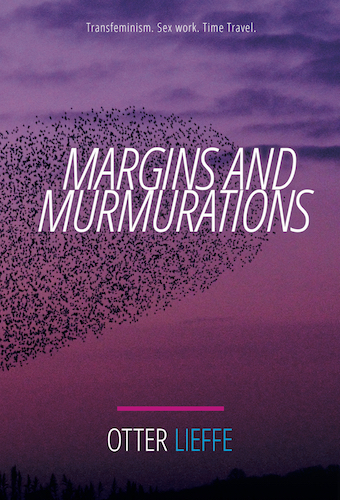 Not only does Margins and Murmurations have themes and characters that people constantly request, it’s also a great book in and of itself! Her offer to lead a campaign to send LGBT Books to Prisoners new softcover books means that we’ll be able to send it to as many people as possible (since many prisons have restrictions about hardcover and used books).